Today a man came up to Robbie and told him …that he is his inspiration for working out at the gym. Very sweet! 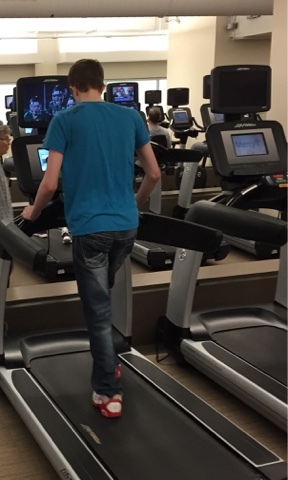 Here is a picture of Robbie on the treadmill for the first time. He started on the stationary bike that has pedals that hold his feet to keep his leg from falling off. He normally goes for awhile on the elliptical too. We continue to go everyday to try to get his leg working again. I promised him that if he will go, that I will go with him and workout too. We started the day after Christmas. Before that we were only going a couple days a week in addition to PT. He is already seeing a difference. He can wiggle his toes more and has some feeling coming back in his heel. Most his lower leg is still numb, but little steps towards improvement. He is also walking better. His leg is still bent, but hopfully working out frequently will help his leg to straighten out.